OK, it's really not a game, because there's no winner. But theTag Line Game can be a diverting challenge for creatvely-minded film buffs. The goal of the game is to make up a tag line for an actual movie. This week's spotlight film is The Wizard of Oz. One of its original tag lines was the "biggest sensation since Snow White." Another was "Metro-Goldwyn-Mayer's Technicolor Triumph!" "Who needs Narnia? 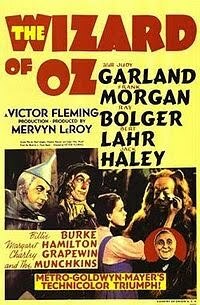 The Wizard of Oz has a lion, a witch, and a whole house of furniture!" "Before Powell and Pressberger...watch the movie with the original Red Shoes!" Yikes, I just heard some virtual groans. I'm sure you can do better than me, so please add your own tag lines as comments. Also, you don't have to limit yourself to this week's spotlight film. If you think of a tag line for another film, feel free to list the movie and your own creative tag line. The only rules are to keep it clean and have fun! Stop monkeying around! Fly to the theater, get your bubblicious lollipop, and check out this smart, heartfelt, and courageous tale of girl empowerment! head over the rainbow to Oz today! You'll believe a house can fly! You'll believe a monkey can fly! More little stars than there are in heaven? Do you represent the Lollipop Guild? Do you wear shoes with bling bling? Have your property taxes increased because your house landed on a witch? If you said yes to any of these, then say yes to THE WIZARD OF OZ today! He's funny, he's terrifying, he has 5 DIFFERENT FACES --- Frank Morgan IS....OZ! Hey, everyone, I thought these tag lines were pretty darn inventive and a lot of fun! Thanks for playing this week. If anyone has a recommendation for next week, just leave a comment. If you are moving soon, watch this movie. Move not just your belongings but your whole house!! Move your house as fast as a tonado at no expense. And whatever street your live on will lead to the same place...an golden road that travels to the mysterious Oz.